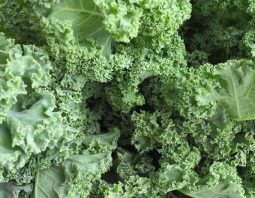 This kale salad will make people swear you have a fancy personal chef. It’s that good. I originally developed this recipe for the New York Apple Growers Association for their RubyFrost apple. It’s a pretty sophisticated crunchy and slightly tart apple. 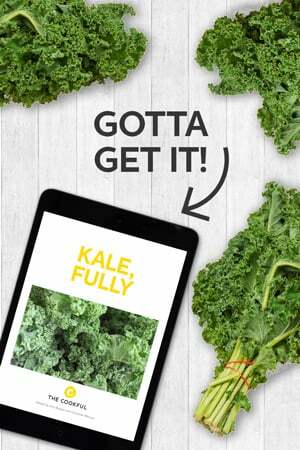 Using it on a trendy beet and kale salad seemed like an obvious thing to do. But how to tie it all together? I turned to one of my all-time favorite books, The Flavor Bible. If you don’t have this, you need to get it pronto, especially if you’re someone who likes creating your own things in the kitchen. What it is is a book, a big book, organized alphabetically by ingredient. For each ingredient it lists a whole bunch of things that go with it. The ideas I can come up with when I consult these lists. Wow. In this case, I had a look at what beets go with and then had a look at what apples go with. One of their commonalities was horseradish. Yes, really. Well. Horseradish, it was to be! I made up a creamy dressing with a bit of spicy horseradish in the mix (note: buy the jars of horseradish found in the refrigerated section of the grocery store, not on the shelf. They typically have much stronger and better flavor). It’s subtle but it really does bring everything together just as I’d hoped. 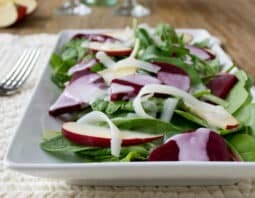 I know you’re going to love this salad and I hope you’re inspired by The Flavor Bible and that you find delight in refrigerated horseradish too! Melt the butter in a small saucepan over low heat. Stir in the water, vinegar, sugar, horseradish and salt. And the mayonnaise and stir until the sugar has dissolved, 1-2 minutes. Remove from heat. Divide the kale or salad greens among 4 plates. Top with the apple slices and beets. 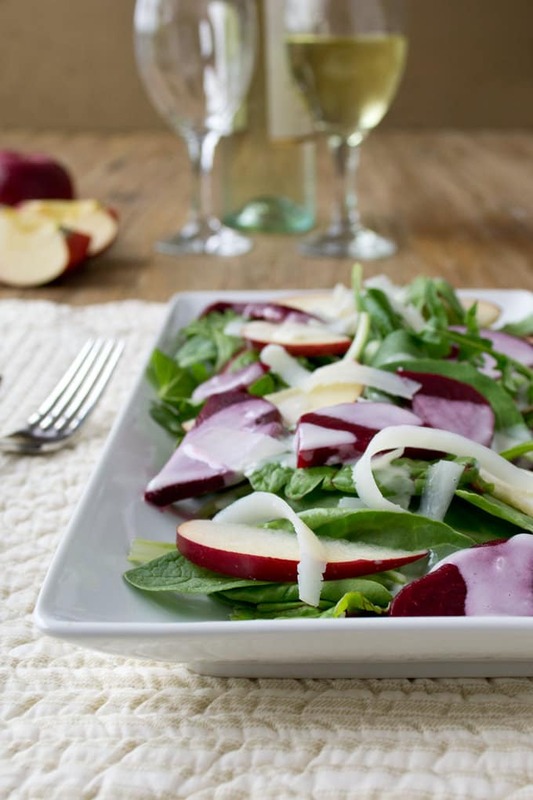 Use a potato peeler to shave Manchego or Parmesan cheese over each salad or dollop each with some of the goat cheese. Drizzle each salad with 2 Tablespoons of the dressing. You will not use up all the dressing. Store the remainder in an airtight container for up to 2 weeks. This recipe was developed for the New York Apple Growers and has appeared on my blog COOKtheSTORY as well. Disclosure: I was compensated by the New York Apple Growers Association to develop and photograph this recipe and to share it on my personal blog COOKtheSTORY, but not to share, years later, on TheCookful. I did that just because I like the recipe so much. All opinions are my own.